While Google Glass is one of the finest and innovative technology, I, personally, hate the design of it. I wish it looked more like normal glasses. Granted it looks futuristic, but it really isn’t for everyone, especially people with prescription glasses. Well, for those of you wanted a normal looking Glass, you are in luck as Isabelle Olsson, the lead industrial designer of the Glass team, posted a new design of Google Glass on her Google +  page. 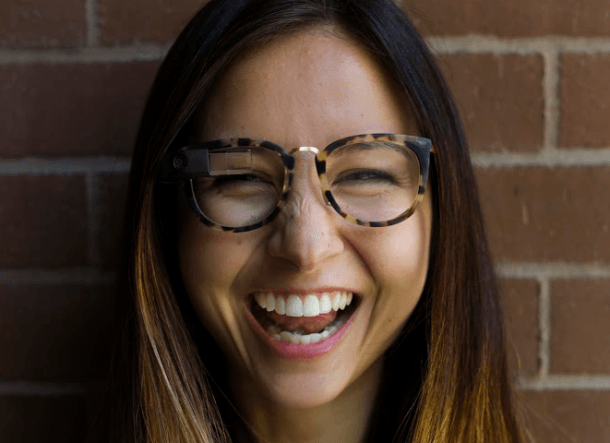 At first glance, you can hardly tell the model (Amanda Rosenburg – Google Glass marketing manager) was wearing Google Glass as it looked like she was wearing a pair of regular glasses. While this new design may not be for everyone, it sure looks more fashionable and regular than the current design and I could honestly say that Google Glass may eventually come in many ‘normal glass’ designs. What do you guys think? Which one would you wear? Let us know in the comment section below .